It wasn’t that long ago that 40 mm was the largest size available in Rolex’s catalog. The classic men’s Rolex dress watches, such as the Day-Date and Datejust, had 36 mm cases, while the Professional models, like the Submariner, Daytona, and GMT-Master sported 40 mm cases. However, in the mid-2000s, that all changed when Rolex debuted the Yacht-Master II, followed by a host of other plus-sized Rolex watches that were released over the course of the next decade. If you’re a fan of big timepieces, then read on as we highlight the large Rolex watches, all of which have case diameters greater than 40 mm. 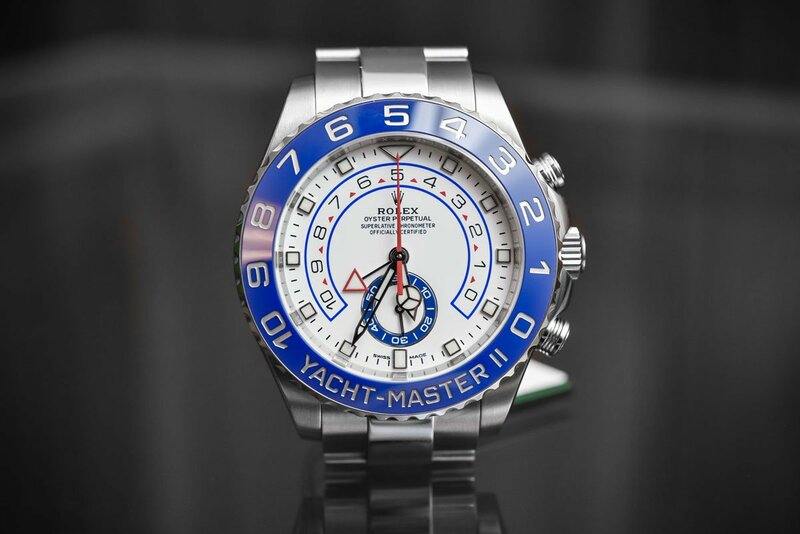 The Rolex Yacht-Master II has a case diameter of 44 mm. Rolex unleashed the big and bold Yacht-Master II in 2007, which paved the way for the brand to begin producing larger watches. With a 44 mm Oyster case and a bright blue Cerachrom (ceramic) bezel, the Yacht-Master II is not a subtle watch in the slightest. In addition to being one of Rolex’s flashier watches, it is also one of the Swiss watchmaker’s most complex pieces, as it features an adjustable regatta countdown timer with a mechanical memory for use during professional yacht racing competitions. The Deepsea is the largest Rolex dive watch with a case diameter of 44 mm. 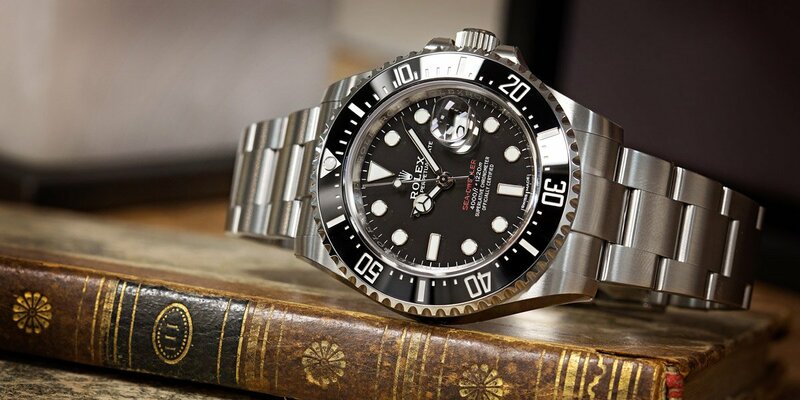 Plunging into the scene in 2008, the Deepsea Sea-Dweller is the king among the various large Rolex watches, and still remains Rolex’s biggest timepiece to date. While on paper it has the same 44 mm case diameter as the Yacht-Master II, its Oyster case is much thicker to accommodate Rolex’s innovative Ringlock System, which enables the Deepsea to have a mind-blowing 3,900 meters (12,800 feet) water resistance rating. Accompanied by an Oyster bracelet with two extension systems, this is one tough tool watch that can withstand extreme conditions, yet it remains perfectly suitable to wear as an everyday luxury sports watch. 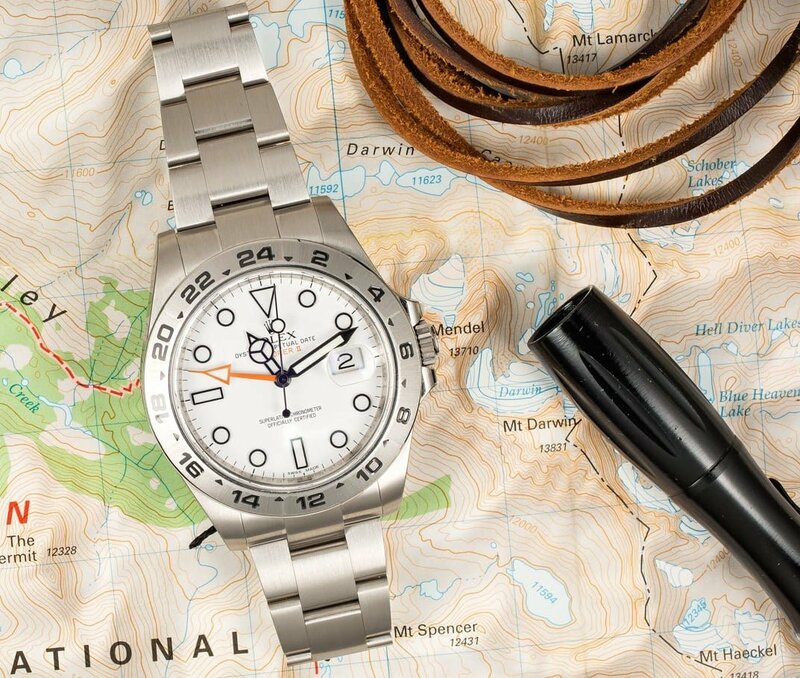 The Rolex Explorer II ref. 216570 is bigger than its predecessor with a case diameter of 42 mm. To celebrate the 40th anniversary of the Explorer II model in 2011, Rolex introduced a revamped version of their robust dual-time sports watch. Merging modern elements, like a larger 42 mm case, with vintage-inspired details, such as the return of the bright orange, arrow-shaped 24-hour hand, the new Explorer II offers buyers the best of both worlds. Whether it is fitted with a sleek black dial or a fresh white “Polar” dial, the current Explorer II is stylish, practical, and generously sized, making it perfectly suited for those who are interested in large Rolex watches. 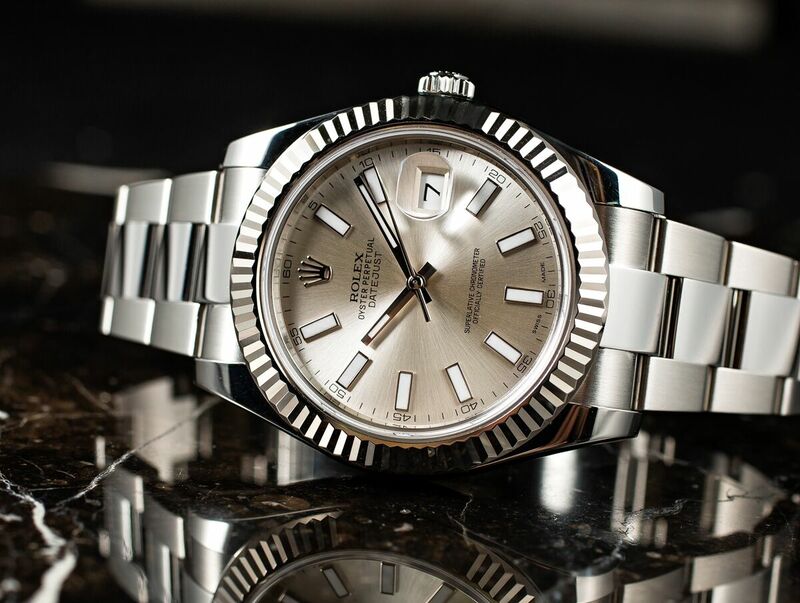 At 42 mm in diameter, the Sky-Dweller is the largest Rolex watch available with a fluted bezel. 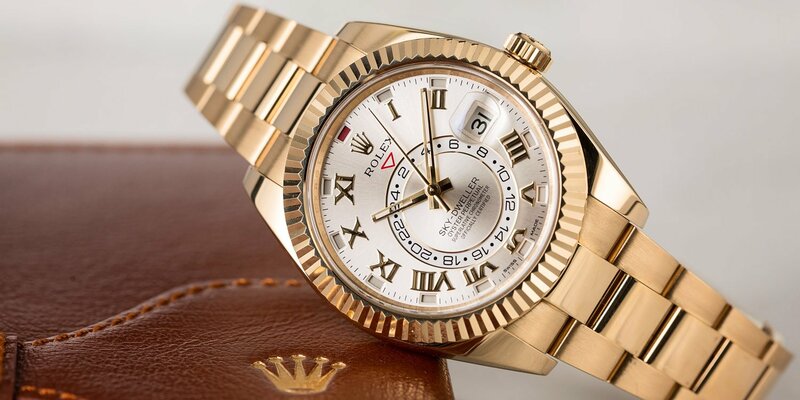 In 2012, Rolex unveiled an entirely new watch model dubbed the Sky-Dweller. Not only was the Sky-Dweller the dressiest men’s watch the company had released since the 1954 debut of the Day-Date, but it was also the most complex watch to join Rolex’s lineup in over five decades. Featuring an annual calendar complication that only requires resetting once per year, the 42 mm Rolex Sky-Dweller is capable of simultaneously displaying the local time, a second time zone, the date, and the month — all of which can be easily set thanks to its fluted “Ring Command” bezel. The Rolex Datejust 41 has significantly more wrist-presence than the classic 36 mm men’s Datejust. Rolex famously launched their Datejust line back in 1945 as the world’s first automatic chronometer to include a date window on the dial. For over 60 years, the men’s Datejust was exclusively offered with a 36 mm Oyster case; however in 2009, Rolex introduced the Datejust II collection, which increased the Datejust’s case diameter to 41 mm. Perhaps future watch scholars will consider the Datejust II a transitional model since Rolex replaced it with the current Datejust 41 in 2016. On paper, it features the same 41 mm case measurement as its predecessor; however the Datejust 41 has leaner lugs, a slimmer case, and a slightly thinner bezel. Internally, the Datejust 41 has also seen an upgrade, and receives Rolex’s new Caliber 3235 movement, which provides the Datejust 41 with an increased 70-hour power reserve. The new Rolex Sea-Dweller is only slightly smaller than the Deepsea with a case diameter of 43 mm. For Baselworld 2017, Rolex made a controversial move with an updated version of their beloved Sea-Dweller dive watch. 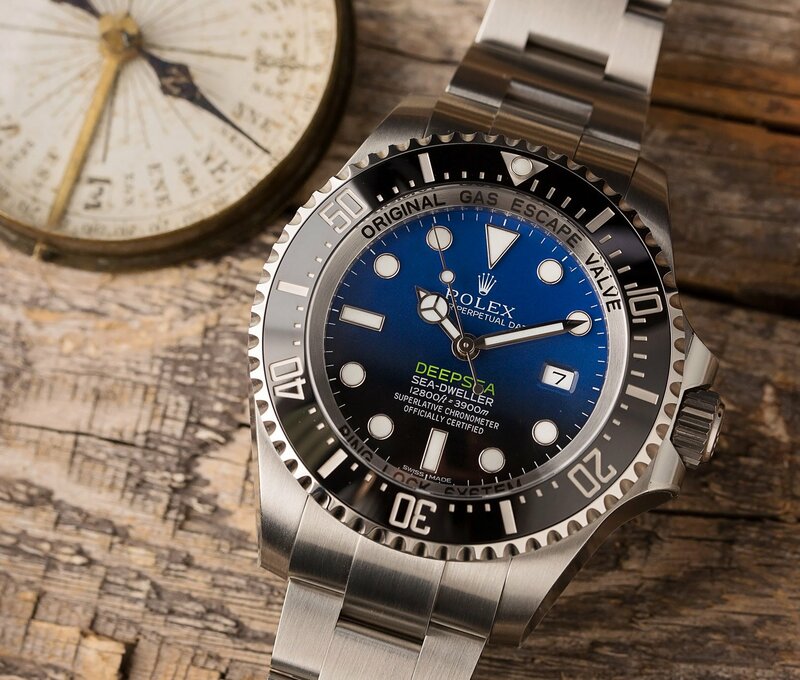 Breaking away from the Sea-Dweller’s customary 40 mm case diameter, the Sea-Dweller now dons a larger 43 mm case, further distinguishing itself from the similarly-styled Submariner, and catering perfectly to those interested in large Rolex watches. In addition to the increased size, another somewhat divisive design element was the addition of the Cyclops magnification lens to the crystal above the date window. Despite the heavily-debated updates, the one thing that almost everyone could agree on was that the red writing on the dial was highly reminiscent of the coveted vintage “Single Red” Sea-Dweller (SRSD) and “Double Red” Sea-Dweller (DRSD) models. Prior to the release of the Yacht-Master II, large Rolex watches (case diameters greater than 40 mm) were virtually non-existent. While it may have taken a while for Rolex to join the trend, it has now become clear that the brand has fully embraced bigger timepieces. Between these new, larger references and their more classically proportioned models, Rolex now offers a fantastic range of watches in a variety of different sizes.